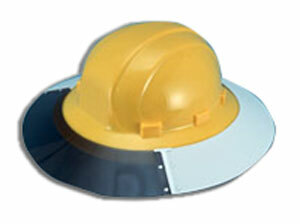 PRODUCT: #17973 SUN SHIELD FITS OMEGA II (#19911 type) FULL BRIM HARD HATS, WHITE/SMOKE (hard hat not included). 12 Shields /Case. Price / Each Shield. Adds additional UV protection for face & neck. Opaque covering with see through smoke colored Lexan front for overhead visibility. Model AS4E attaches to ERB Omega II Full Brim. Weighs less than 3 oz. #19911 White Hard Hat, OMEGA II Full Brim 6-Point Suspension with Mega Adjustable Ratchet. OUR BEST SELLING FULL BRIM HARD HAT.